We haven't been in to see our little pride and joy for 3 days!! With colds and allergies going around the house, we were too scared to bring any germs up to the hospital. I cried for about half an hour after arriving to her room today. She is SO much bigger than the last time I saw her (Saturday!) She has gained half a pound since then!!! She's averages 40-50 grams gained a night now!! Her eyes are open so wide now! The CPAP was a wet mask that irritated her skin. She had red spots from the mask. Now since she's been off CPAP for several days, her face is perfect coloring and no irritation. She just looks, so beautiful!!!! To me, she looks less fragile. I'm not afraid of taking her home. I feel so excited to be able to dress her in clothes soon and to be able to actually hold her like a baby, not just chest on chest kangaroo care!! Exciting times coming!!! Speaking of home, we have our Homeward Bound class the end of this month!!! WOW!!!! 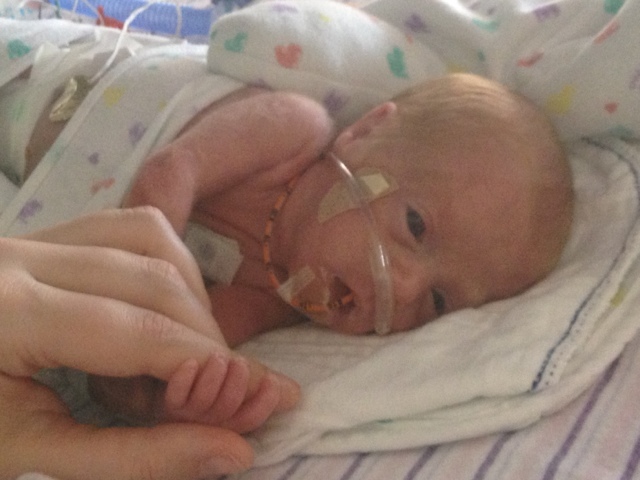 Briella is completely on nasal cannula alone. She is doing so well on cannula that they are talking about weaning her oxygen level down next week!! Also her murmur has been silent for awhile now, so they will revisit un-restricting her fluids next week. That is huge because they won't have to add calories to her milk. What they do is add 2 parts high calorie formula to my 1 part breast milk. Next week we can (hopefully) reduce or eliminate formula so she is on 100% breast milk. That will reduce her chances for NEC greatly. Briella will have a follow up brain ultrasound on Monday to monitor the white spots that were found last week. On Wednesdays the hospital provides a free scrapbooking event. They provide all the pages, materials and pretties. It brought me so much joy to be able to sit near her room and just have a fun project to do and have someone to chat with. It was like free therapy. I was able to make 2 pretty pages today and hope to continue to make additional ones weekly. Maybe by the end of the stay I will have a whole book! Please pray that Briella stays infection and NEC free and that her white spots in her brain disappear and she is healthy. She is beautiful! Prayers continue daily for ALL of you!